Sciency Thoughts: Homes evacuated after landslide breaches air-fuel tanks in New Zealand. Homes evacuated after landslide breaches air-fuel tanks in New Zealand. 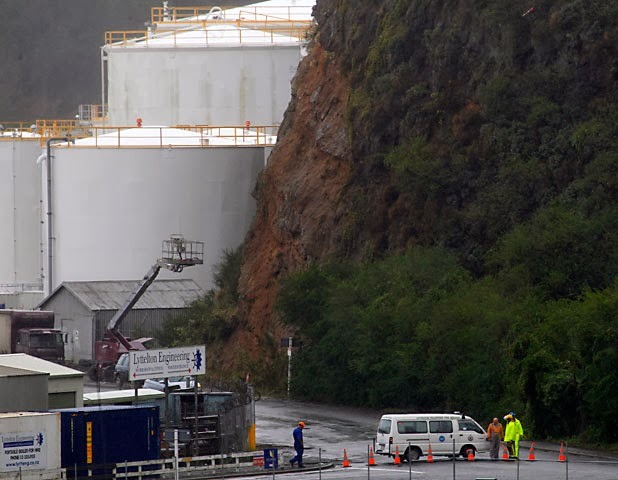 Nineteen homes near Lyttelton Port, roughly 5 km southeast of Christchurch on New Zealand's South Island, have been evacuated after a landslide breached a storage tank containing aviation fuel and dented a second container, at about 2 pm local time on Wednesday 5 March 2013. The fuel from the breached tank was mixed with rainwater, but has been contained by a containment wall and ﻿it should be possible to pump this into an empty tank at the same facility. There are no reports of any injuries, and the evacuation is precautionary in nature. The site of the 5 March 2014 Lyttelton landslide. Daniel Tobin/The Christchurch Press. The incident comes after ﻿160 mm of rain fell on the town in just 24 hours. Landslides are a common problem after severe weather events, as excess pore water pressure can overcome cohesion in soil and sediments, allowing them to flow like liquids. Approximately 90% of all landslides are caused by heavy rainfall. The area around Christchurch has been hit by high rainfall and gale force winds this week, the worst flooding since 1975, with over 100 homes flooded and over 3500 left without electricity. Whilst the worst of the storm appears to have passed, meteorologists are predicting a further 60-80 mm of rainfall may be yet to come. 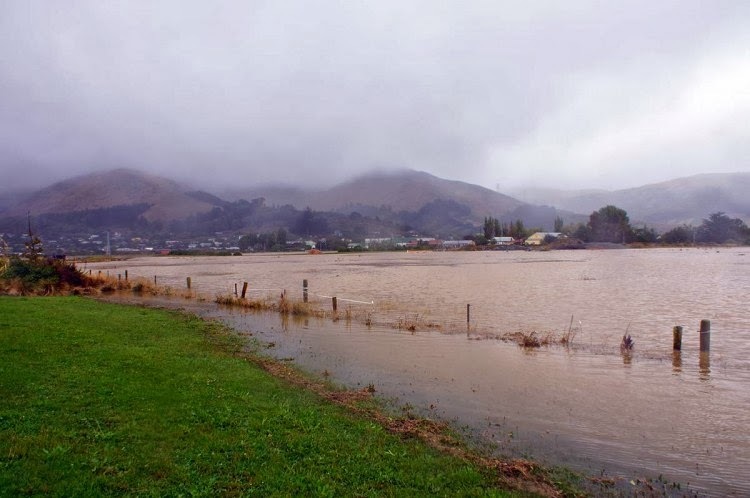 Flooding﻿ around Ferrymead on the outskirts of Christchurch. Christchurch Dailly Photo. See also Magntude 4.6 Earthquake near Christchurch, New Zealand, Magnitude 4.7 Earthquake under Cook Straight, New Zealand, Magnitude 6.6 Earthquake and series of aftershocks hit South Island, New Zealand, New Zealand rattled by Earthquakes and Woman killed in New Zealand landslide. ﻿Follow Sciency Thoughts on Facebook. The nature of the Chicxulub impactor. Eruptive activity on Mount Merapi, Java. Dinosaur remains from northwestern Saudi Arabia. A new species of Sweeper from the Comoro Islands. Six killed by landslide at Myanmar jade mine. Asteroid 2014 AY28 passes the Earth. Los Angeles shaken by Magnitude 4.4 Earthquake. Worker killed at British Columbia mine. The Kepler 210 planetary system. An American Hyaenodontid in China. A new species of Crocodile from West Africa. Magnitude 6.3 Earthquake on the Peruvian coast. A new species of Sawshark from the Philippines.